Posted in Research News on July 30, 2015 by Tanya Schoor. One of the highest awards presented within NOAA will be awarded to the NSSL team that developed Multi-Radar Multi-Sensor, a system that helps forecasters manage the flood of weather data available to them. 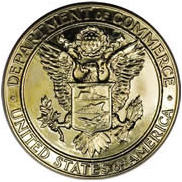 Under Secretary of Commerce Kathryn D. Sullivan announced the award of a NOAA silver medal for science/engineering achievement. 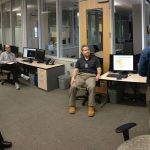 Their work was a collaborative effort with the University of Oklahoma’s Cooperative Institute for Mesoscale Meteorological Studies. 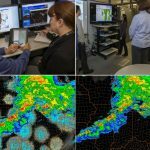 The MRMS system, which became operational throughout the National Weather Service in October 2014, quickly harnesses the tremendous amount of weather data from multiple sources, intelligently integrates the information, and provides a detailed picture of the current weather. 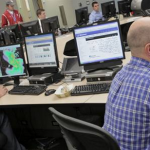 MRMS uses a holistic approach to merging multiple data sources, allowing forecasters to better analyze data and potentially make better predictions. 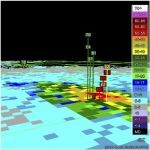 The new MRMS products, generated every two minutes, combine multiple radars, along with satellites, surface observations, upper air observations, lightning reports, rain gauges, and numerical weather prediction models. With this data, forecasters are able to better visualize high-impact weather threats like heavy rain, snow, hail, and tornadoes. This, in turn, leads to better forecasting techniques and improves lead time.